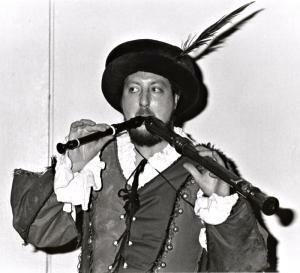 John plays a bewildering array of recorders, crumhorns, shepherds pipes, and whistles, in sizes ranging from tiny to enormous, and does so in a virtuoso manner than leaves audiences entranced - particularly when he performs his trademark pieces such as the Paginini Variations or the Faerie Dance. His now famous piece Schizophrenia - in which he plays two recorders and hums at the same time - always elicits gasps of surprise. Classically trained, he is an expert on early music and has played with a number of orchestras which specialise in this area. 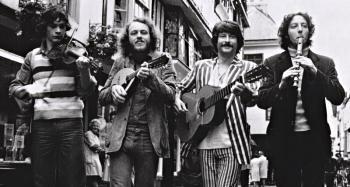 His ability to play with and absorb the influences of a wide range of musicians meant that he also found an equal capability in the folk scene and for many years was part of the immensely popular Fourth Estaite which included Robin Harper who is now better known as the Green Party's first Member of the Scottish Parliament. John has gone on to work with such stars as Johnnie and Phil Cunningham, and Anne Lorne Gillies.